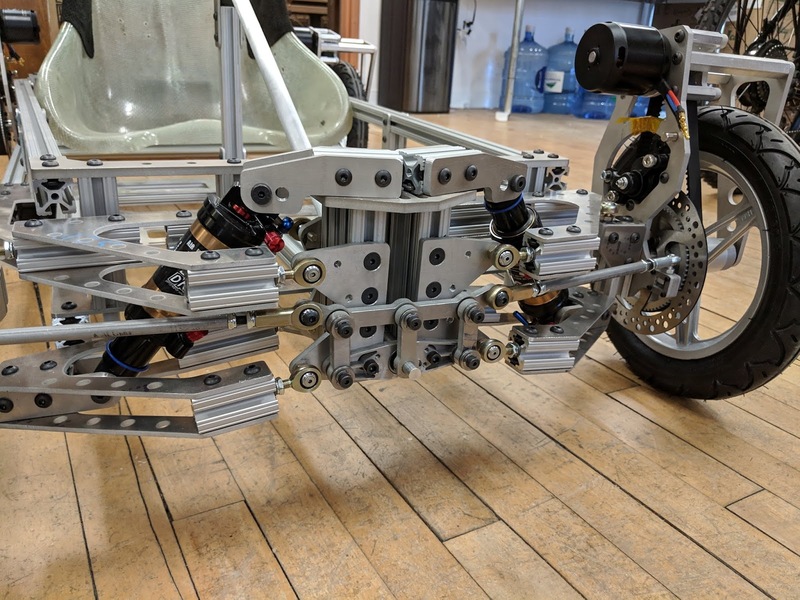 The frame and suspension is mostly a kit of aluminum plates and 80/20 extrusion, with almost no post-machining required, so it went together very quickly. 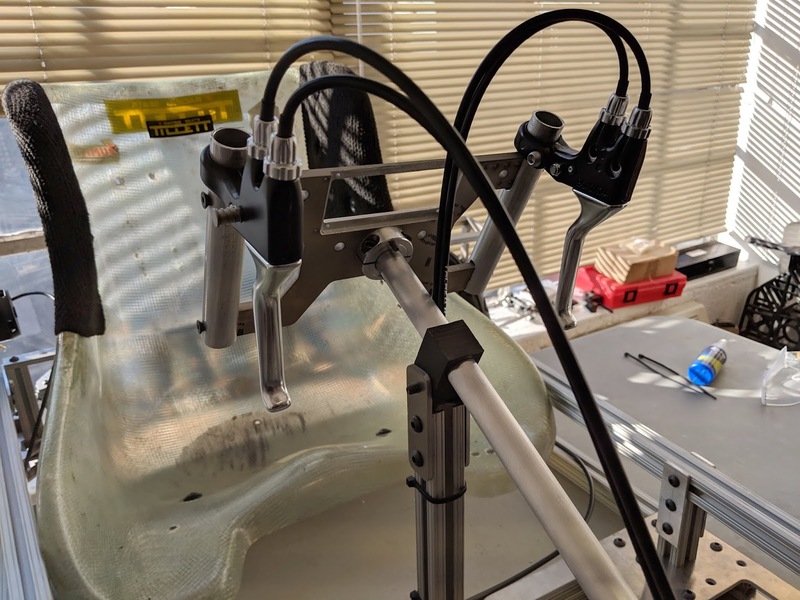 After the main box frame assembly and seat mounting, I started with a test build of a single corner of A-arm geometry to make sure I hadn't missed any clearance issues. 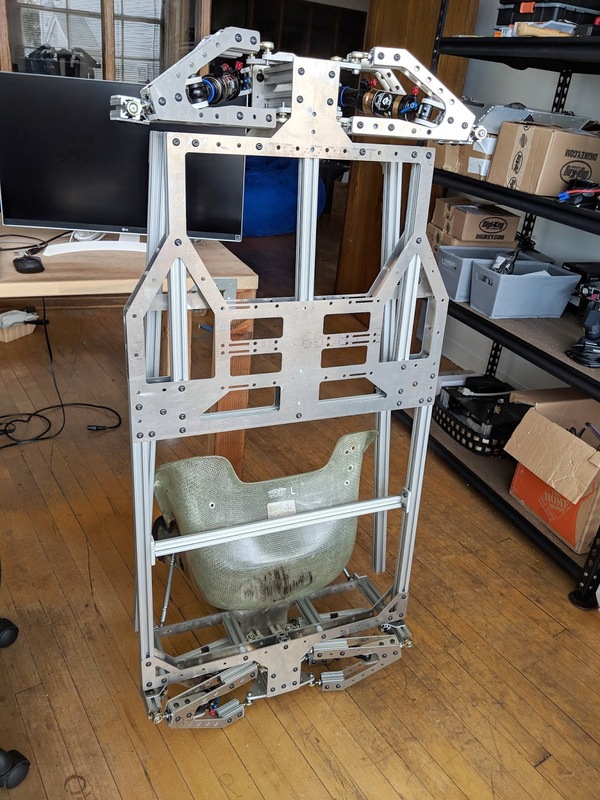 I also wanted to get a first impression of the stiffness in real life, since that's probably the biggest risk of this new design. I had no trouble at all with the front-right corner. Everything fit together as planned and the stiffness felt adequate, largely thanks to the zero-slop QA1 ball joints. I was actually a little surprised at how well-behaved it felt. Once all six ball joints and the air shock pins were tightened down, it really did have only the degrees of freedom it should have: one for steering and one for suspension travel. There's no rattling or play at all. With high confidence from the test corner, I went into production line mode for the other three. 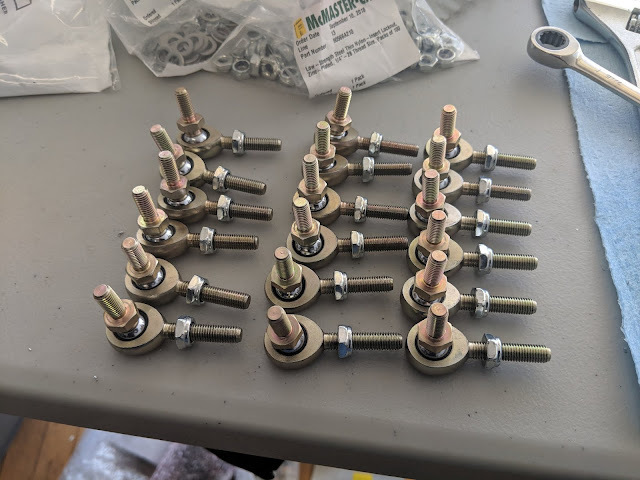 PTFE-lined QA-1 1/4-28 rod ends (CMR4TS) are the real stars of this build. It would not be possible with McMaster's selection of ball joints, which are either cheap and overly loose or expensive and overly tight. I say there was almost no post-machining, but just tapping all the 80/20 ends was a whole day of work. About here is where the perfect build ended, though, because when I went to attach the front-left corner, I discovered that there was a slight interference between the A-arms and the air shock valve stems. The parts I designed, all 2D plates, are 100% symmetric, so I didn't bother to model the other corners. But the shocks themselves are not symmetric, so it wasn't exactly correct to assume that things would fit together the same in the mirrored configuration. Since the interference was minimal, I debated cutting notches in the A-arms for the valve stems. But I was able to find a more satisfying solution. Minor issues aside, I am pleased with how the chassis turned out. It's much stiffer than tinyKart, thanks to a slight excursion into the third dimension, but still very light. 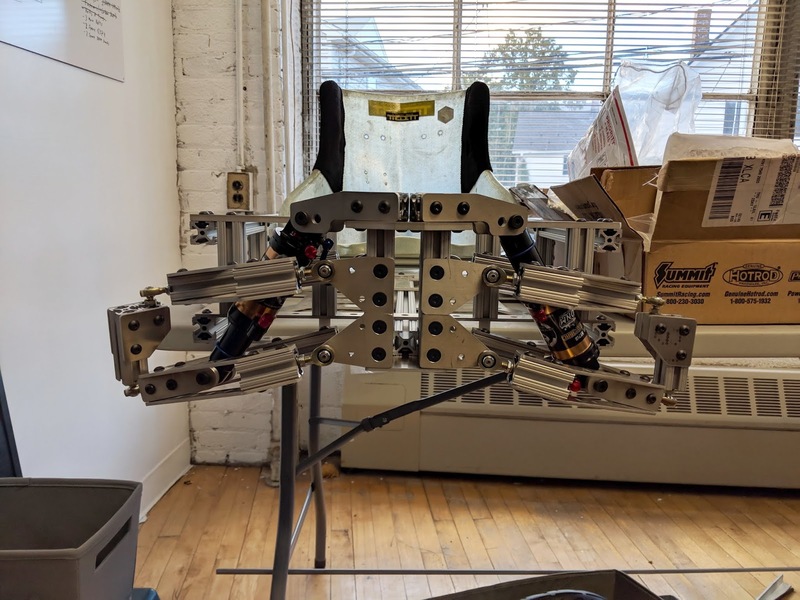 And I went from 50% to 99% confidence on the suspension design after getting hands on the assembled corners. 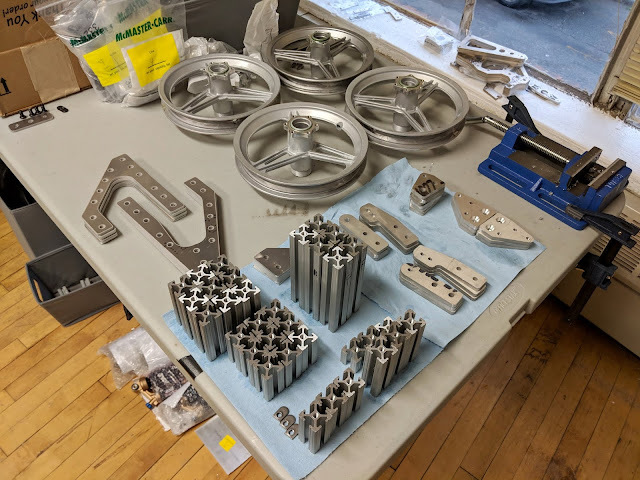 Most of the machining for this build was for turned parts within the four drive modules. The spindle shafts for the wheels were made from 7071 aluminum and support the wheel bearings (6902-2RS). 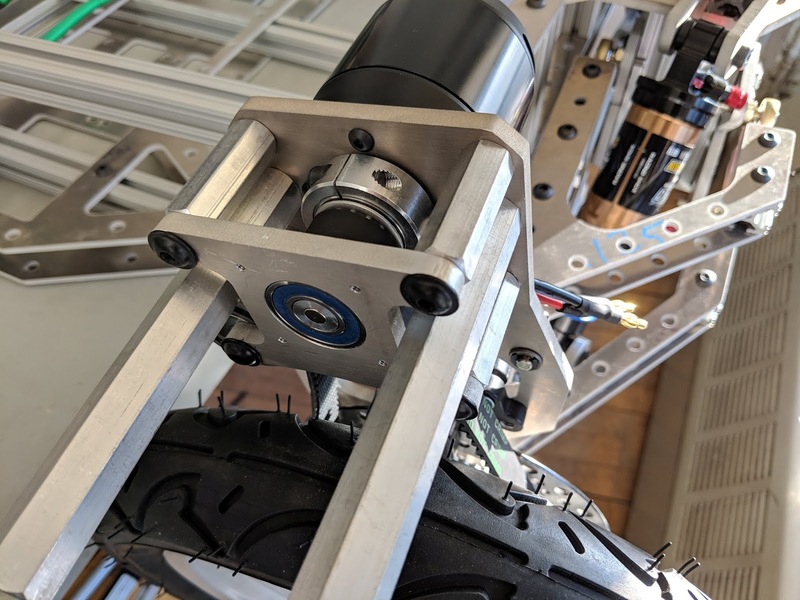 Unlike on tinyKart, the shafts are doubly-supported within a box structure built around the wheel, which should be much more impact tolerant. The large drive pulleys got some weight reduction and a custom bolt pattern to interface with the wheel hubs. My favorite bit of packaging is the brake caliper occupying the volume inside the belt loop, with the brake disk flush against one side of the wheel pulley. Torque is sourced and sunk from the same side of the wheel - in fact from the same metal plate. The motor shaft and motor pulley also required some custom machining. 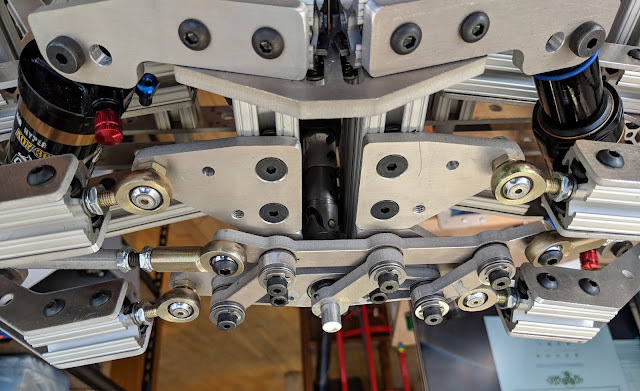 This was a weak link on tinyKart: The original design used set screws on shaft flats, but it was prone to loosening over time (or, in one case, completely shearing off the 10mm shaft at the flat). After switching to keyed shafts (via Alien Power Systems motors), those problems mostly went away. But there was still axial play, and the torque was still being transmitted through a 3mm key into an aluminum keyway. 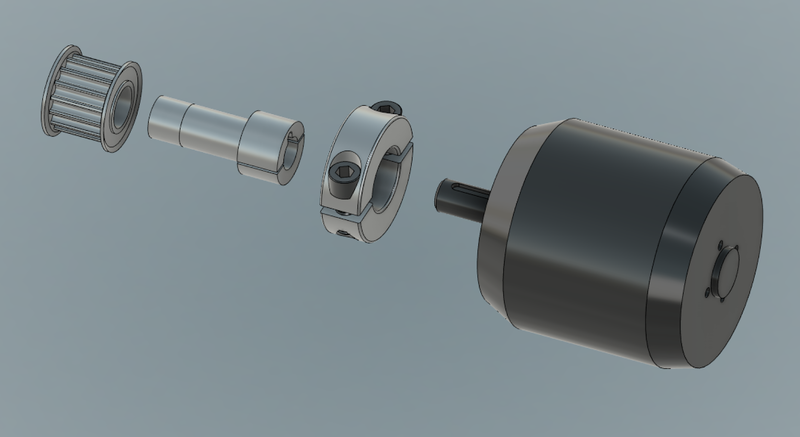 For TinyCross, I wanted to have a clamping and keyed shaft adapter so the torque would be primarily transmitted through friction, with the key as back-up. There's not a lot of room to work within the 15-tooth drive pulley, so that just gets bored out as much as possible and then pressed like hell, with retaining compound, onto a 7071 adapter. This adapter then gets the 10mm bore with a 3mm keyway. But it also gets slotted, turning it into a clamp. 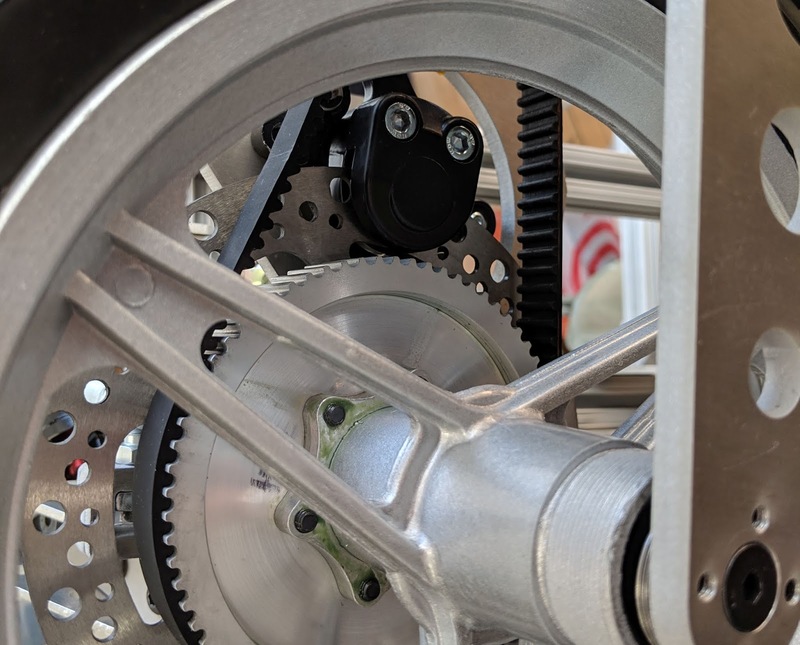 Finally, an off-the-shelf 0.75in aluminum clamping collar tightens the whole assembly down onto the motor shaft, with the key in place. Additionally, the outboard side of the shaft interfaces with another bearing, for double support, and has a pocket for a shaft rotation sense magnet, to be picked up by a rotary encoder IC. For brakes, I opted for the same disks, calipers, cables, and levers as on tinyKart. I briefly debated going hydraulic, but the plumbing for four wheel disk brakes seemed like an unnecessary nightmare. tinyKart never had a problem with braking torque; it could easily lock up both front wheels. It just had so little weight on the front wheels that braking and steering were often mutually exclusive activities. With four wheel disk brakes, TinyCross should be much more controllable under braking. The TerraTrike dual pull levers are key to making this work: they have a fulcrum between the lever and two cable ends that ensures both cables get pulled with equal force. I have one such lever for the two front discs and one for the rears. Independent rear brake lever...what could go wrong? 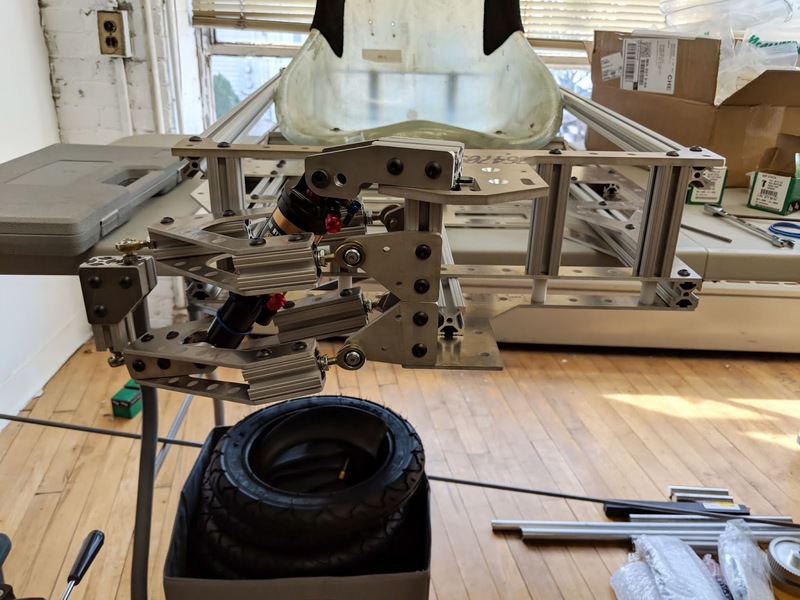 The last piece of the mechanical puzzle is the steering. At each wheel, there's a steering arm that terminates in a place to mount yet another ball joint, using a T-nut. 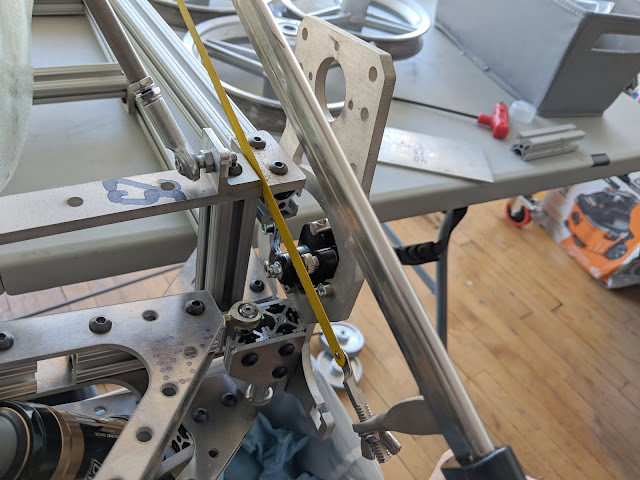 This is driven by a link comprising a threaded rod with an aluminum stiffener, another trick carried over from tinyKart. 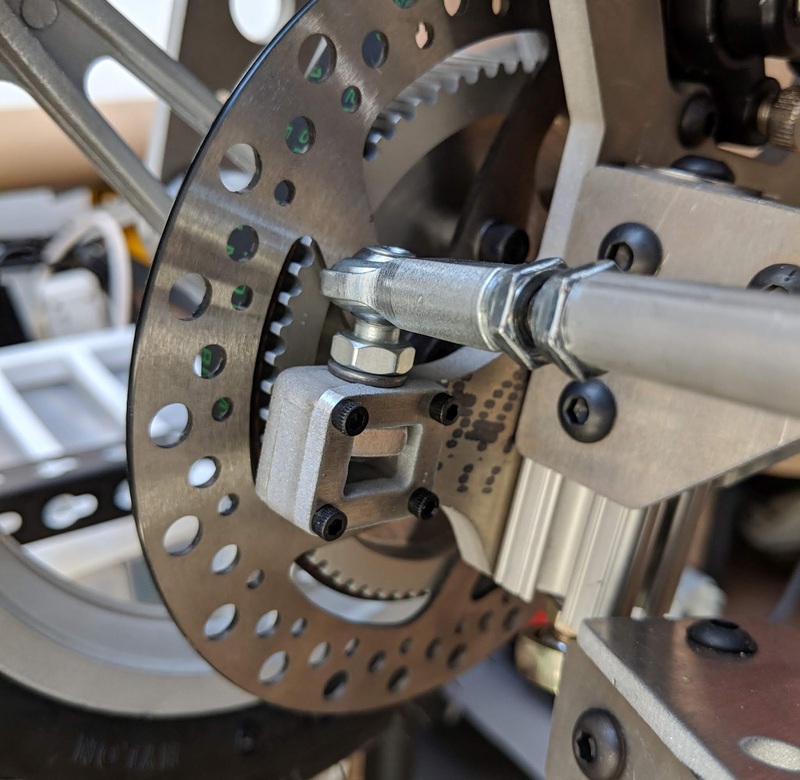 The aluminum stiffener is compressed and the threaded rod is stretched by two nuts, creating a link that's stiffer than either part by itself. For the rear wheels, all that's required are two fixed mounting points for the other end of these rods. Rear toe angle is set by adjustment with the threaded rod. The toe-setting plate doubles as the TinyCross badge. 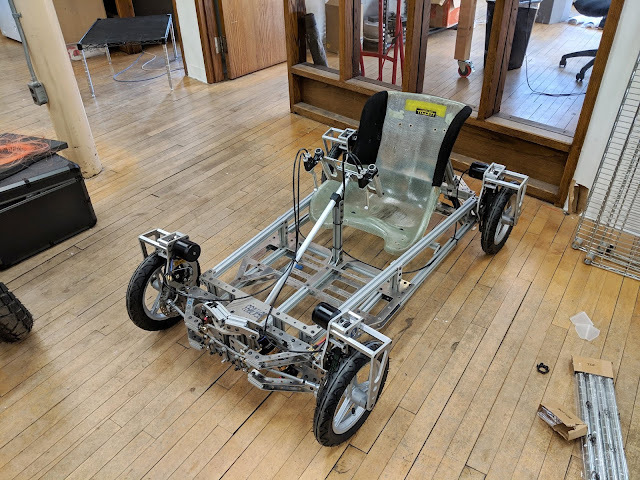 The front requires an actual steering mechanism. 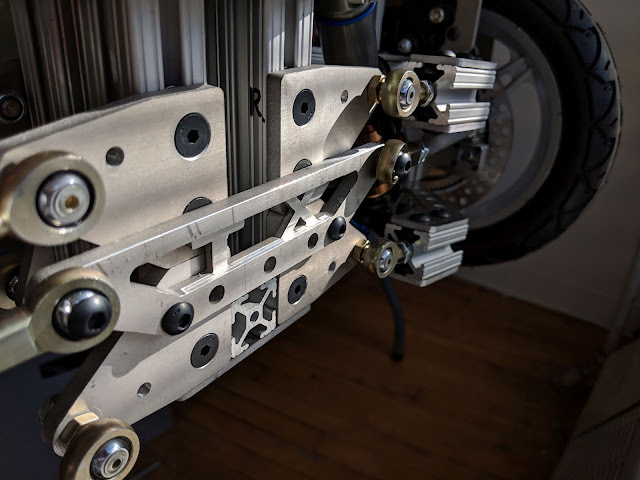 In lieu of a rack-and-pinion, I used a simple four-bar, driven by the steering column through a universal joint buried in the middle of the front suspension support tower. Each link in the four-bar has its own set of thrust bearings and radial bushings, to minimize the extra linkage slop. And just like that, it rolls. Unfortunately, although the frame and suspension were on-target, the four power modules are way over weight budget. The wheels themselves are annoyingly heavy. I can't do much about that, but I can probably take some weight out of the surrounding assembly. A lot of the design is driven around the off-the-shelf cast aluminum rims. If I am willing to chop down the rim and re-machine its outer bearing bore, I can probably save a little weight and a lot of width. I can maybe even get it below 34in, which would help with getting through doorways. But for now I will shift focus to the electronics. 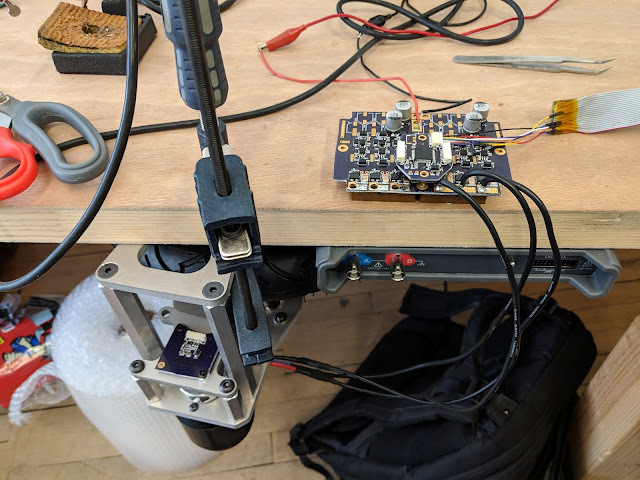 Preliminary bring-up of the motor drives has been uneventful (that's a good thing), but I'll need to actually hook them up to LiPos next, which could always become interesting in fiery ways. Nice Build, i like the independant supension. Keep updating this!! !